As reported to ECDC by Belgian authorities, on 2 September 2014, following a human error, 45 litres of concentrated live polio virus solution were released into the environment by the pharmaceutical company, GlaxoSmithKline (GSK), in Rixensart city, Belgium. The liquid was conducted directly to a water-treatment plant (Rosieres) and released after treatment in river Lasne affluent of river Dyle which is affluent of the Escaut/Scheldt river. 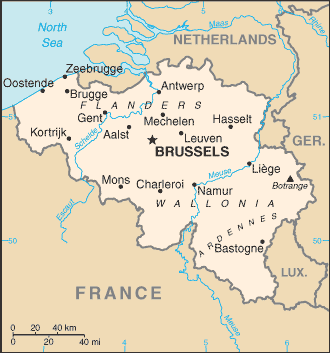 Belgium’s High Council of Public Health conducted a risk assessment that concluded that the risk of infection for the population exposed to the contaminated water is extremely low due to the high level of dilution and the high vaccination coverage (95%) in Belgium. ECDC’s assessment is that the accidental release in the environment of large amounts of live polio virus represents a risk to public health if susceptible populations, such as areas with low polio vaccine coverage, are exposed to contaminated waters or mud. Particularly since the Lasne and Dyle rivers are joining the Escaut/Scheldt river which flows in the southwestern part of the Netherlands where various orthodox protestant communities present a lower polio vaccination coverage, before reaching the North Sea. The National Travel Health Network and Centre (NaTHNaC) reports:- Public health authorities in Belgium carried out a full investigation and risk assessment following the incident. Water plant workers, considered at higher risk of infection, were given polio vaccination. The risk to others exposed to contaminated waters, including fishermen and swimmers in the Lasne river, was considered to be limited. However, until further notice and as a precautionary measure, a booster dose of polio vaccine was recommended for those who in contact with water of the river Lasne since 2 September 2014 . To date, no official explanation has been given for the ‘human error’ though some media sources report that an employee made a mistake during routine cleaning of a tank at the plant. Taking Steps To Alleviate Poverty: Shoes That Grow!